Elliot Coleman. The New Organic Grower: A Master’s Manual of Tools and Techniques for the Home and Market Gardener. 30th Anniversary Edition. Chelsea Green, 2018. 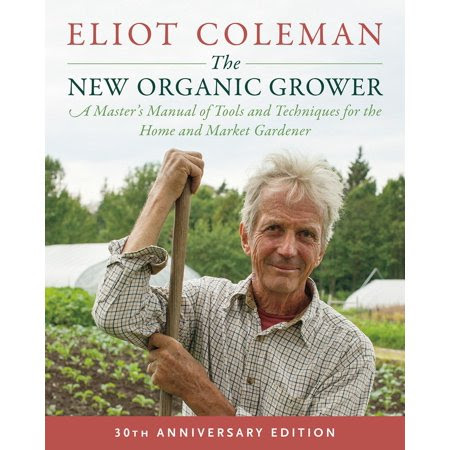 The first edition of this book came out in 1989 and it has been an essential tool for organic farmers and home gardeneres ever since. Coleman’s goal is to make everyone want to farm organically. Fortunately, he knows a lot. He knows about soil fertility, pests, weeds, crop rotations, agricultural craftsmanship, land, labor, marketing, and the economics of all of this. His philosophy? A pleasure to read. « Round-up in Cheerios? What are we feeding our children?